I'm beginning to think I start my posts with way to much "I am no means an expert" but in a way, I AM my own expert. I mean I'm human, I make mistakes and have bad days, buuuuut I have spent a lot of time trying to make my days run smoothly, effectively, and without wasted effort and time. I almost drive myself insane with the amount of info I try to consume in a day between books, podcasts, IG, blogs + more. SOO that being said, there are some things that have helped my over loaded mind and Type A personality function as a mom. 1. WAKE UP BEFORE YOUR KIDS. I still struggle at this because I tend to stay up too late working on projects, and have "me" time after the kids and husband have had my attention for a solid 16 hours, but it is so valuable. Waking up before the crazy gives me a chance to make my bed, drink my coffee, think about my day and feed myself before all my attention goes to the kids and getting all the things done. Then when the kids wake up I am actually excited and feel like I can give them 100% instead of dreading rolling out of bed to a toddler needing a diaper change and 'snack?snack? snack?' ya feel me? yeah. Thankfully I have a great group of women who helps encourage me and keeps me accountable for trying to get something in a minimum of 3 days a week. MANY times it's just a 45 min walk/jog after dark when the kids have gone to bed or are watching a movie with dad but since I have made this a priority I sleep better, feel better about my body, have a clearer head, and have a chance to listen to my own music or podcast without interruption. I'm kind of a multitasker. Whether it's running errands, paying a few bills, going to the library, or just a park outing. I absolutely have to leave the house everyday. Many times we go get coffee and get to the park with friends and it's enough to make my heart content. I think the trick to this is getting out first thing in the morning so you are able to be home for nap time, husband coming home, and starting dinner... other wise the day ends to quickly and you didn't get your things done and your rushed and feeling claustrophobic. Anyway, this summer I plan to do more adventurous things and planned out days to keep us busy and going. Living in the PNW I hate to waste a beautiful day and will trudge through nap time to savor every minute. With at least one thing. Mine happens to be eyelash extensions. A total splurge but I don't spend money on pedicures, spray tans, hair, or massages. All things that I would totally love to do but don't have the time or money for right now so I chose one thing that I had to have and would make my life much easier. I LOVE them and I get to chat with a girlfriend for an hour while I lay with my eyes closed. WIN WIN. Truly extensions have made getting ready so much easier and really boosted my self esteem which is soooo important when you're a stay at home mom. You can lose yourself, it's true. Krew knows I'm happy when I get to go on a date with dad and he loves it too cause then they get to go hang out with grandparents without us. 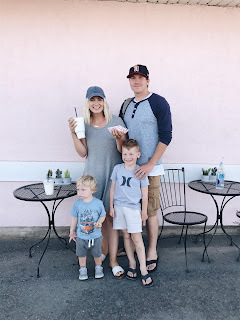 We love spending time together all day everyday but of course both of us sometimes need a break and it's always exciting for them when they get to go see Papa and mom and dad come back from their date happy and content. I truly think one of the best things you can do for yourself and your kids is to be in a stable and loving relationship.